The all-conquering Canadians return with a brand new single to celebrate their return to the UK to play their first (sold out) headline UK tour, Glastonbury, T in the Park and Oxegen. 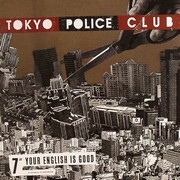 This is a standalone single – not featured on their recent mini album ‘A Lesson in Crime’ – exclusive to this release. - "Your English Is Good"